For most NBA teams during this compressed schedule, a day off is a reason for celebration, a rare respite from the relentless churn of the schedule. For the Knicks, a day off is just an excuse for blind quotes, blaring headlines, and furious dissent. Six-game losing streaks are the worst. Yeah, on the Knicks' day off, everyone took a deep breath and decided to let the world know that the team was falling apart. First, there was the "Mike D'Antoni has lost the team" business. That came from ESPN's Chris Broussard, who, in many ways, sort of echoes the argument that Ben Mathis-Lilley made on this site two days ago: Mike D'Antoni is too normal and regular a guy to whip these guys into shape. "The players like Mike as a person," one source said. "They think he's a good guy. But he doesn't have the respect of the team anymore." In addition to questioning D'Antoni, players are complaining about playing time, and confused about the offensive and defensive schemes. When Anthony first returned -- and it still appears to be the case -- Lin would bring the ball upcourt and try to run D'Antoni's system. When Anthony would abandon the offense, Lin would not pass him the ball, which irritated Anthony, sources said. So when Lin tried to talk to Anthony on the court, Anthony would turn his back to the point guard and tune him out. So with all that going on, and the trade deadline coming up tomorrow, you can probably guess what's next. The Daily News argues that the Knicks should trade Carmelo and Amar'e Stoudemire for Dwight Howard and Hedo Turkoglu, but that's the very definition of a fantasy-land trade. But that's nothing compared to what the Post says. They claim that Carmelo officially says that he wants out. That's right: Just more than a year after he forced his way here, the Post claims that Carmelo wants to force his way out. According to the source, Glen Grunwald has had just one conversation with Anthony since he became GM. And D’Antoni rarely talks to Anthony after games, especially since Anthony’s return from a groin injury. Anthony is not close to owner James Dolan the way Amar’e Stoudemire is. The source said Anthony gets along best with assistant GM Allan Houston, who eventually could succeed Grunwald. “He knows Glen doesn’t like him,’’ the source said. For what it's worth, Carmelo's agent has denied that he wants to be traded, calling the idea "total nonsense." Not that it'll matter, at least until the Knicks start winning. And so, here we are. Is Mike D'Antoni going to fight back against all this, or just say "screw it?" Today's pregame press conference should be fascinating. But not nearly as fascinating as the MSG crowd's reaction to Carmelo tonight in a 7:30 p.m. game against Portland. 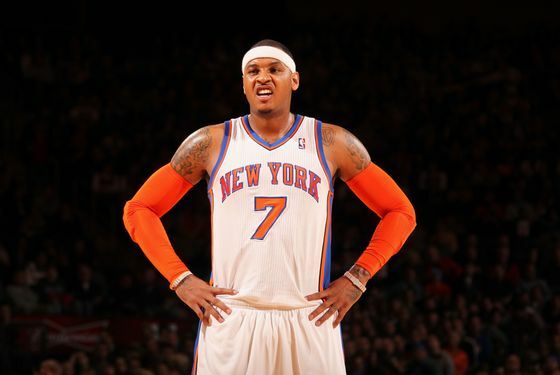 The Knicks need a win desperately ... but the crowd might need to get out its Carmelo frustration even more. Strap in, folks. It could get a bit crazy tonight.